Two individual exhibitions: DAAD Gallery and Gallery Max Hetzler Temporary. Photos and information. 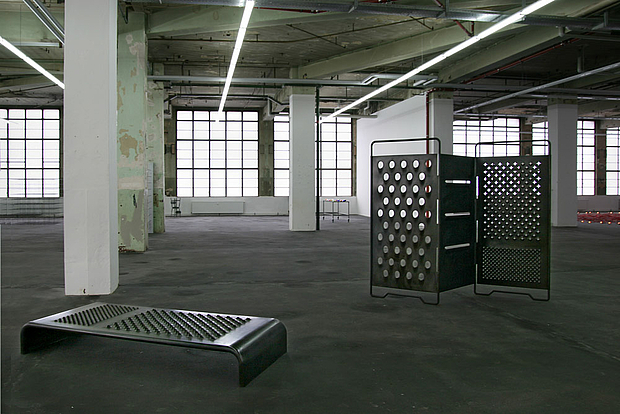 Since her stay in Berlin in 2003-2004 in the framework of a stipend from the Deutscher Akademische Austauschdienst (DAAD - German Academic Exchange Service), Mona Hatoum has maintained her ties to the city, where she still has an apartment and a studio. From May to June 2008, the artist has two parallel solo exhibitions in Berlin; they are documented in photos here. Mona Hatoum is showing a constantly changing installational sculpture at the gallery of Berlin’s DAAD artists program. 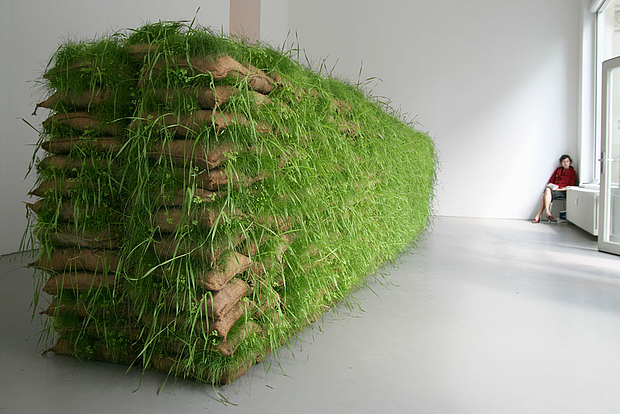 Hatoum had 770 jute sacks stacked up to head level; the resulting pile is 10 meters long and resembles the sandbag barricades used in battle as shelter from enemy gunfire. But in this case the sacks are filled with seeds that continue sprouting throughout the duration of the exhibition. The artist thereby seems to take up a conceptual thread from her early works, which were located in the area of performance: temporary works in public space. Galerie Max Hetzler Temporary is staging a solo exhibition of previously unshown works by Mona Hatoum in the OsramHöfen, Oudenarder Str. 16-20 in Berlin’s Wedding district. In it, the artist takes up several themes that have become symbols of her work in the last decade. The works deal with everyday objects, but transform them into strange and disturbing sculptures.